You deserve to experience Bliss or Harmony. To take time for you to pause, get out of your head, relax and create. Learn and feel renewed. Expand your understanding of energy and ways we can use it to our benefit. Capture on paper or canvas your interpretation; The vibrancy of Radiant beauty, the peace of Harmony and Serenity of Bliss. No expectations or judgment – simply free intuitive expression. In these workshops art and alchemy meet. No art experience is neccessary, just a desire to paint and enjoy yourself. You will be guided to experience Harmony. It will be easy to achieve with the help of Harmony energetic mist.The delightful energy of Harmony will be misted above your head in the form of bright delicately scented energy spray. The mist is hand made using pure and natural essential oils of Sweet Orange, Sandalwood, Kashmir lavender and the essence of Oneness. 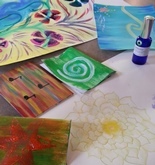 In this enlightening experience you will be guided into expanded awareness, then through a creative painting process to create an intuitive and unique work of art. In time remaining we will have fun sharing our experience and artistic expressions. This workshop will provide a unique, relaxing and creative experience you'll want to tell your friends about. Feel Bliss and paint it. Even if you are stressed when you walk through the door we will have you feeling Blissful while you’re here. It will be easy to get out of your head and paint from the heart with the help of Bliss energetic mist. The peaceful energy of Bliss will be misted above your head in the form of bright delicately scented energy spray. The mist is hand made using pure and natural essential oils of Frankincense, Geranium rose and Rose combined with the energy of flower and crystal essences. In this enlightening experience you will be guided into expanded awareness, then through a creative painting process to create an intuitive and your unique work of art. In time remaining we will have fun sharing our experience and artistic expressions. This workshop will provide a unique, relaxing and creative experience you surely won't forget. Reconnect to feeling happy, centred, confident and beautiful. It will be easy to achieve with the help of an energetic mist. The delightful energy of Radiant Beauty will be misted above your head in the form of bright delicately scented energy spray. The mist is hand made using pure and natural essential oils of Citrus, Rosemary, lavender, Geranium Rose, Sandalwood combined with the energy of flower and crystal essences. In this enlightening experience you will be guided into expanded awareness, then through a creative painting process to create an intuitive and your unique work of art. In time remaining we will have fun sharing our experience and artistic expressions. 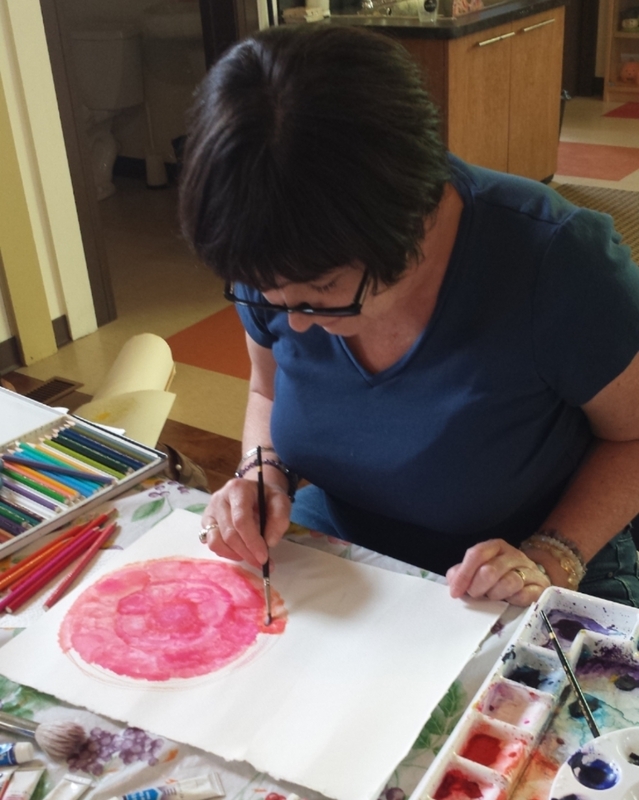 This workshop will provide a unique, relaxing and creative experience you'll want to do another class.